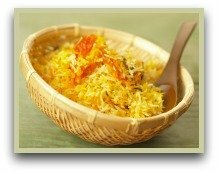 It really is simple to make, if you can make plain boiled rice then making this saffron rice recipe is no problem. As the threads are added after it's cooked, you need to cook some plain rice first. This is how I make mine, you can cook yours anyway you prefer. Enjoy! You can also use this method with other grains like cous cous, quinoa and bulger wheat to name just a few. You'll find this ingredient in many famous dishes like Indian pilau, Spanish paella or Milanese risotto, to name a few. ...You can use the cheaper turmeric spice or the much more expensive saffron threads. If you use turmeric in your dish, it must be boiled in and depending on how much you use, the colour of your grains will range from pale yellow to orange. But if it's glorious colour AND a delicate flavour you're after, then the threads are definitely the thing to use.